We have less than two weeks until Thanksgiving and something happened overnight with our weather and it’s finally fall in Florida. It always feels pretty weird to heat up the oven and cook fall foods when it’s still 85° out so I’ll take any cooler weather I can get. 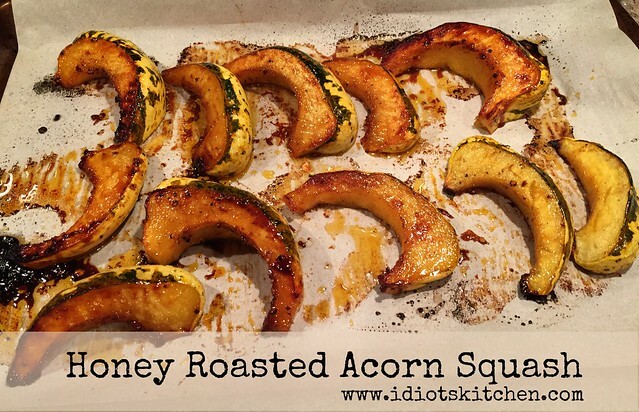 Fall brings us one of my favorite foods – hard squash like acorn, sweet dumpling, and delicata – any of which will work for this simple recipe. I’ll admit, the most difficult part is often cutting the squash but I have some tips for that. 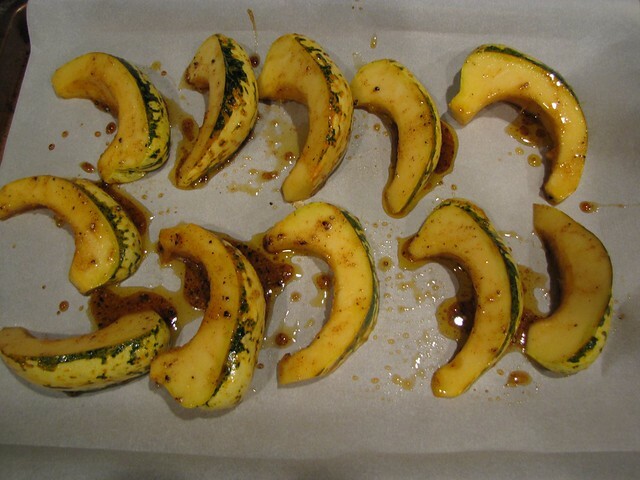 Once the cutting is out of the way, the squash gets a quick sweet and smoky glaze and then into the oven. Perfect for any fall meal – I served mine with pork chops, Honey Roasted Acorn Squash might also get a turn at the table this Thanksgiving. Preheat the oven to 350 degrees. If you’re cooking something else at the same time, this can cook at any temp from 350-400°. First, if your squash has a stem, use the handle of your knife or even a pair of pliers from the tool box to knock it off. Then turn your squash over and cut off the tiny little nub end at the very bottom. That way you’re not trying to cut through something super woody and tough. 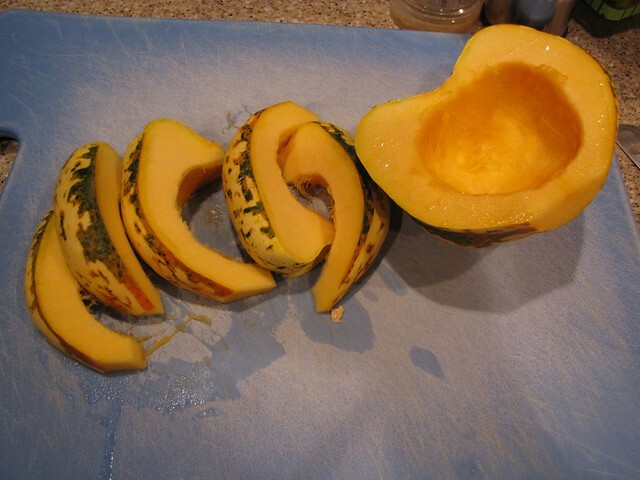 Cut the squash in half lengthwise and scoop out the seeds. Then using the ridges of the squash as a guide, cut the squash into segments. This is easiest to do if you turn the squash cut side down on the board and just follow the ridges with your knife. 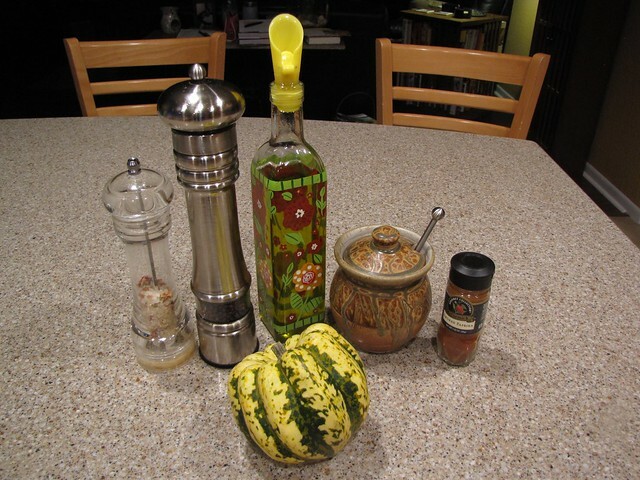 Note that this method works best for acorn type squash. If you have a delicata squash, the best way to cut them is into rings. Depending on how big your squash is or how much you want to make, you can easily adjust the amounts of the glaze ingredients. We’re big squash eaters so I cooked 1 small squash for 2 servings. 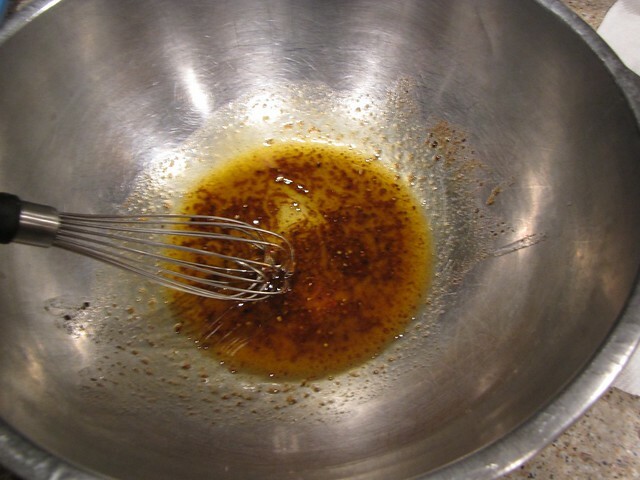 In a medium bowl, combine 2 Tablespoons olive oil and 2 Tablespoon honey. 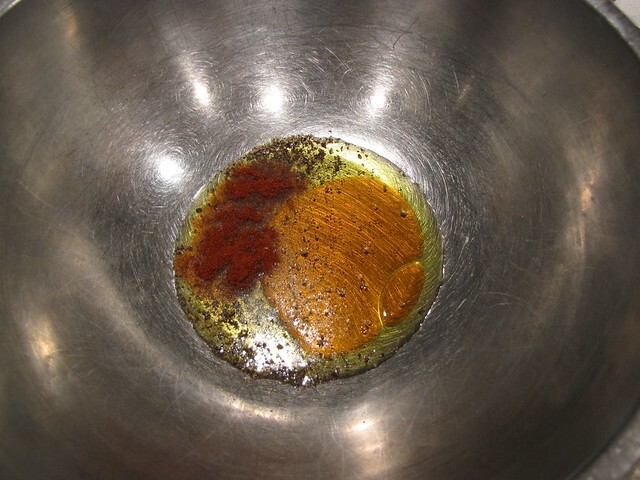 Add 1 teaspoon smoked paprika and salt & pepper to taste, or about 1/2 teaspoon each. Whisk to combine. This will probably start to separate right away so if you don’t have your squash ready to go, give it another quick whisk. Add the squash to the bowl and toss it around in the glaze with your hands. Try to work the glaze into the fleshy parts of the squash as much as possible. 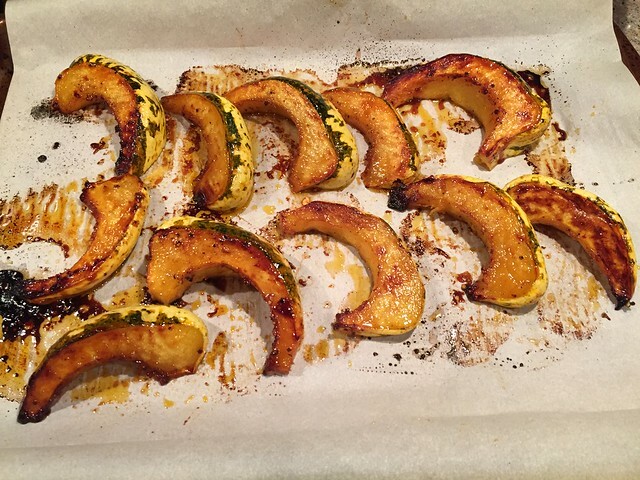 Place a piece of parchment paper on a baking tray and arrange the squash segments in a single layer. Don’t skip the parchment unless you want to spend the next day scouring your pan. You can use foil, but the squash will stick to it as well. 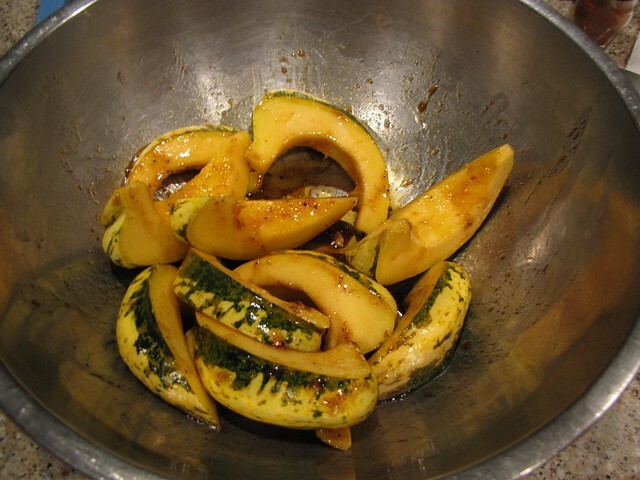 Use a spatula and your fingers to get any remaining glaze out of the bowl and onto the squash. Bake the squash at 350° for 30 minutes or until tender when poked with a small sharp knife. If you think about it, you can turn the squash over at about the 20 minute mark so both sides get a glorious, golden brown. Or, if you forget like I did, just serve it golden side up and no one will ever know! When you eat this, you can either eat the squash and the peel or use your table knife to gently trim away the very outside layer. If you’re making this for Thanksgiving, you can make it ahead, hold it at room temp, and gently reheat it when you are ready to eat. I love squash so I’m happy to have another quick and easy method that works as a side to just about any meal. Oh, this is going to happen soon around here. We usually bake acorn squash cut in half and set upright like a bowl filled with a bit o butter and maple syrup and brown sugar. Plain old baked acorn squash with butter and maple syrup is my absolute favorite. Ain’t no school like old school! Claudia, So glad it has finally cooled off a bit here in sunny Florida. I’ve made roasted butternut squash a few times lately. Before I got my Oxo Y Peeler, I used to have to microwave the squash for a few minutes before I could tackle the task of peeling it. This Oxo Y Peeler is the bomb! Best peeler I’ve ever had. Cuts through the raw butternut squash skin literally like butter . I cut the squash up into chunks, spray it with a little olive oil, and sprinkle it with a bit garlic salt. 400 degrees, 20 minutes on one side; 20 minutes on the other. Love, love, love parchment paper for easy clean-up.